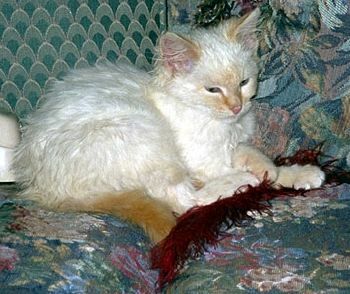 Read Maxwell's Journal - The Diary of a FeLV+ Cat, started January 20, 2000 on his fifth "purrday". Maxwell was included in an article about Feline Leukemia at VetCentric.com....the article is reprinted here with permission. Maxwell came to me as a tiny babycat of about 10 weeks in April 1995. He had been abandoned out in the country near the home of a friend of mine. He found his way to her front porch, and from there, into my home and heart. 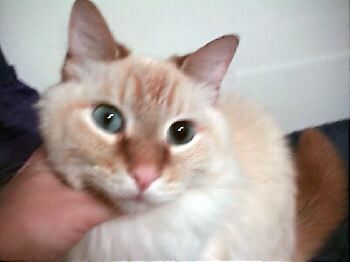 (You can read more about Maxwell's early story at the Comeback Kitties page where our Dexter's story is, also.) That was back in the early days when I had not been owned by cats for all that long and wasn't aware of all the precautions to take when bringing home a new kitten. (For those of you who might be in that position now, please segregate your new arrivals until they've been fully checked out by your vet. That will help protect the health of your current pets as well as that of your new one.) At any rate, after bringing Maxwell home on a weekend, I took him to the vet on Monday for his checkup. 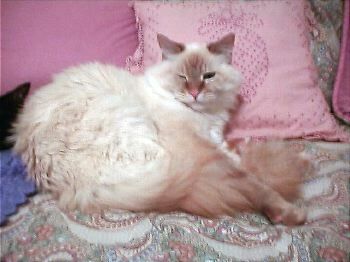 He tested very weakly positive for Feline Leukemia. I was devastated, but the vet wasn't convinced it was accurate and encouraged me to have him tested again at six months of age. We did that, and it remained very weakly positive. Again, the vet wasn't convinced, so we tested again at one year, then again at age two, and every time the result was positive. The final time, we tested with the more reliable IFA test that has to be sent to an outside lab rather than the office ELISA test. At that point, the vet and I both had to admit that he really did have the disease. There are many excellent resources available on the internet addressing this dreadful and heartbreaking disease so I won't try to duplicate that information here. If you have a FeLV+ cat or are interested in more information about the disease, I would encourage you to check out our FeLV links to other sites about the disease. There is a wealth of information available although, regrettably, no cure as of yet. What I would like to do here is tell you about Maxwell's particular manifestation of his illness and provide you with links to other excellent sites that do a better job than I ever could of explaining the medical and technical aspects of the disease. Maxwell continued to be a healthy happy kitty (and still is those things today!) with absolutely no signs of disease until November 1997 when he experienced a serious bout of cholangiohepatitis that took several weeks of fighting by both Maxwell and me to finally beat it. (This topic is also of particular concern to us as this is the disease to which we lost Dexter.) Then, in January 1998, Maxwell experienced the beginning of his eye problems. Both his eyes became 100% dilated. One thing which could cause such an occurrence is toxoplasmosis, so we tested him for it. Although he did not have toxoplasmosis, we treated him as if he did (with six weeks of an antibiotic called Antirobe, or clindamycin). His eyes were improved at the end of that time; however, he has had continual outbreaks of eye problems from that time forward. You can see in the picture below that one of his pupils is dilated while the other is not. There was never any consistency to this. Sometimes one eye would dilate and the next time, the other would, or perhaps one or the other would constrict instead. Since that time until sometime in latter 2001, Maxwell had an inflammation of one or both eyes about once every six weeks or so. It seemed to be worsened by stress and by my extended absence (extended being more than about 3 days). When the eye becomes inflamed, Maxwell becomes squinty eyed. This is due to a condition known as blepharospasm in which the muscles circling the eye spasm and tighten in response to pain. A narrowing of Maxwell's eye is usually the first sign I have that he's going to be having problems soon.